More and more people are eating away from home each year, some due to convenience or recreation and others due to necessity. Whether dining in a fast food restaurant, a school foodservice, a hospital cafeteria, or a fine dining restaurant, people expect safe food and a clean environment. Providing safe food requires careful attention by both management and employees. Since foodservice operations are characterized by high turnover rates, employee training often poses a challenge to managers. Foodborne illness costs lives and money. Millions of people become sick each year and thousands die after eating contaminated or mishandled foods. Children, the elderly and people with weakened immune systems are especially vulnerable to foodborne illness. New estimates for the cost of foodborne illness were released in 2010 and 2012. Scharff (2010; 2012) estimated the cost of foodborne illness in the U.S. to be $152 billion and $77.7 billion, respectively. Scharff included 30 identifiable pathogens plus foodborne illnesses for which no pathogen source can be identified in his estimate, while Hoffmann et al. (2012) estimated that illness from 14 major pathogens that account for more than 95 percent of the illnesses, hospitalizations and deaths in the U.S. cost $14.1 billion. Serving safe food has numerous benefits. By preventing foodborne illness outbreaks, establishments can avoid legal fees, medical claims, wasted food, bad publicity and possibly, closure of the establishment. Some people are more at risk of becoming ill from unsafe food. These populations include young children, elderly, people with compromised immune systems and pregnant women. Microbiological hazards (bacteria in particular) are considered the greatest risk to the food industry. Bacteria usually require Food, Acidity, Temperature, Time, Oxygen and Moisture in order to grow. Controlling any or all of these factors can help prevent bacterial growth. Remember “FAT-TOM” and how it relates to food safety. Temperature and time are the two most controllable factors for preventing foodborne illness. 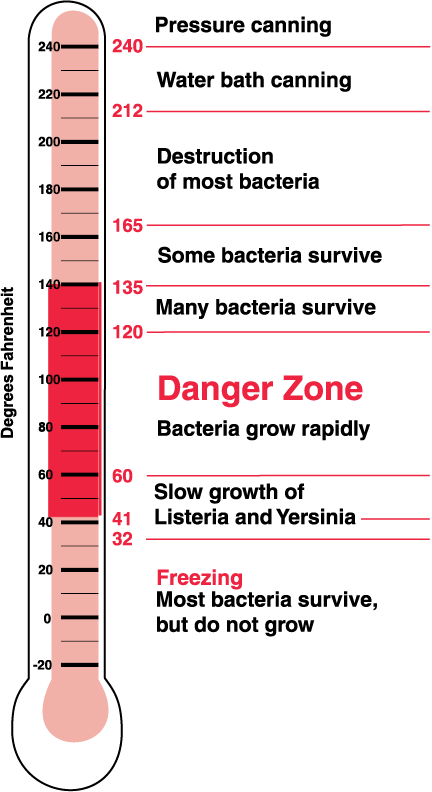 The temperature range between 41 F and 135 F is considered the “danger zone” because these temperatures are very conducive to bacterial growth. Within this range, bacteria grow most rapidly from 60 F to 120 F. When the conditions are right, bacteria double in number every 10 to 30 minutes. For instance, in three hours one bacterium can grow into thousands of bacteria. Cooking food to safe temperature and cooling food quickly, therefore, are critical steps in the prevention of foodborne illness. Certain foods and foodservice procedures are more hazardous than others. High protein foods such as meats and milk-based products and foods that require a lot of handling during preparation require special attention by foodservice operations. Roast beef, turkey, ham and Chinese foods, for instance, have been linked with more outbreaks of foodborne illnesses than pizza, barbecued meat or egg salad, yet all of these foods are considered potentially hazardous. Other foods such as garlic in oil, rice, melon and sprouts also have been linked with outbreaks of foodborne illness. Researchers have identified common threads between outbreaks of foodborne illnesses. Outbreaks usually involve one or more of these factors. 1. Improper cooling of foods — the leading cause of foodborne illness outbreaks. 2. Advance preparation of food (with a 12-hour or more lapse before service). 3. Infected employees who practice poor personal hygiene. 4. Failure to reheat cooked foods to temperatures that kill bacteria. 5. Improper hot holding temperatures. 6. Adding raw, contaminated ingredients to food that receives no further cooking. 7. Foods from unsafe sources. 8. Cross contamination of cooked food by raw food, improperly cleaned and sanitized equipment, or employees who mishandle food. 9. Improper use of leftovers. 10. Failure to heat or cook food thoroughly. • Meats should be inspected by the USDA or other agency with animal health jurisdiction. The parts or packaging should carry a federal or state inspection stamp. • Eggs should have a USDA grade; frozen and dried eggs should be pasteurized. • Shellfish should be purchased from suppliers that appear on public health service Food and Drug Administration lists of Certified Shellfish Shippers or on lists of state-approved sources. The control tags must be available if live shellfish are used. All foods should be in excellent condition when they arrive. The quality and temperature of foods should be closely monitored at delivery. Delivery times should be planned for slow periods whenever possible to allow for inspection. Storage areas should be cleared prior to the receiving shipments, so food can be immediately stored, and the storage areas should be clean and well-lit to discourage pests. Sanitary carts and dollies should be readily available to store foods immediately. • Check frozen foods for signs of thawing and refreezing, such as blood on meat boxes, fluid leakage, frozen liquids at the bottom of the food carton or large ice crystals in or on the product. Refuse shipments that show signs of being thawed and refrozen. • Reject canned goods that are dented, bulging or rusty. Never taste the food in a damaged can. • Check packages to make sure they are dry and the seals are intact. • Refrigerate potentially hazardous foods immediately. Foods should be protected from time and temperature abuse by purchasing according to the storage space available. Keep food in rooms designated for storage -- not in restrooms or hallways. Do not store frozen, refrigerated or dry food directly on the floor or under overhead pipes. Place food on shelves or on mobile equipment at least six inches off the floor. Space foods so air can freely flow around them. Monitor expiration dates and rotate stock. Use the “FIFO” principle – first in, first out. • Maintain freezers at 0 F or lower. Monitor and record temperatures regularly. • Defrost units regularly. During defrosting, store frozen foods in another freezer. • Do not refreeze thawed foods unless they have been thoroughly cooked. • Maintain refrigerators at 41 F or lower. Place thermometers in the warmest and coldest areas of refrigerators; measure and record air temperature regularly. • Do not store raw uncooked meats above prepared foods. • Keep canned and dry goods dry. • Label and date all dry goods. • Measure and record temperature regularly. • Keep all goods in clean wrappers and containers. In most cases, wrap products in moisture proof and air-tight materials. • Do not store foods taken from their original containers in galvanized (zinc-coated) containers such as garbage cans. In addition, food should not be stored in enamelware, which may chip. Tomatoes, fruit punches or sauerkraut should not be stored in metal containers (unless made of stainless steel), due to potential leaching out of metals and other potential toxicants. Foods may be stored in food-grade plastic or glass containers. After monitoring receiving and storage for safety, it is essential to avoid cross-contamination and temperature/time abuse during preparation, cooking, serving and cooling. Calibrated thermometers should be used to monitor temperatures. The following guidelines illustrate safe food handling at each stage. • Wash hands before beginning a task and after every interruption that could contaminate hands. The handwashing sink -- not the prep sink -- should be used. * Use proper handwashing procedures. If plastic gloves are worn, hands should be washed before putting them on. Plastic gloves should be changed whenever changing tasks that could cause contamination. Improperly-used plastic gloves can contaminate foods as easily as bare hands can. * Use clean and sanitized utensils and cutting boards when preparing food. Clean cutting boards thoroughly with hot soapy water, followed by a hot water rinse and a final sanitizing step (1 tablespoon bleach per gallon of water) after using. * Store cooked food and raw food separately. • Wash all fresh fruits and vegetables with clear running water in a designated produce sink or in a ware-washing sink that has been properly cleaned and sanitized. Use a brush as necessary. Detergents are not suggested because they may leave residues. • Disassemble, clean and sanitize meat slicers (and other equipment) on a timely basis. • Wash, rinse and sanitize can openers. Wash and rinse tops of cans before opening. • Prepare batches of food no further in advance than necessary. • Thaw foods in refrigerator units, under cool running water at a temperature of 70 F or lower, or in a microwave oven (depending on the amount of food). If thawing foods in running water, do not allow thawed portions of raw animal foods to be above 41 F for more than four hours. • Thaw ready-to-eat foods above raw food, so the thaw water does not contaminate the ready-to-eat food. • Cook microwave-thawed foods immediately. • Frozen food, such as vegetables and seafood, may be cooked directly to the recommended internal temperature. Allow additional time for cooking. Large food items, such as whole turkeys, should not be cooked from the frozen state. • Cook foods to safe time-temperature exposures. Use a clean sanitized thermometer to measure the temperature by placing the thermometer in the thickest part of the food. In sauces and stews, insert the thermometer at least two inches into the food. • Calibrate thermometers regularly by inserting into a mixture of ice and water and adjusting the reading to 32 F/ 0 C. Thermometers that have been dropped or exposed to extremes in temperature should be calibrated. *Microwave-cooked foods should be stirred and rotated during cooking. After cooking, the food should be allowed to stand for two minutes for even distribution of heat. • Do not interrupt cooking times by partially cooking foods. • Use tasting spoons – not the stirring spoon – to test foods. A clean tasting spoon should be used every time the food is tested. • Keep hot foods hot and cold foods cold. Maintain hot foods at 135 F or higher and cold foods at 41 F or lower. Measure temperatures periodically near the top surface before stirring; stir with a clean, sanitized utensil, measure and record temperature. • Do not use holding units, such as steam tables or chafing dishes, to cook or reheat foods. • Hold cold foods in serving containers on ice; the food should not be in contact with the ice. • Do not put previously held food on top of freshly prepared food. Use up the previously held food first. • Do not handle ready-to-eat foods such as lettuce, ham and cheese with bare hands. Use spatulas, tongs, clean plastic gloves or deli tissue to handle food. • In self-service/buffet situations, provide spoons or tongs so human hands do not touch food. Provide clean plates for every trip through a buffet line. • Linens and napkins used as liners that contact food must be replaced whenever the container is refilled. • Handle plates by their edges, glasses by the bases and cups by their handles. • Handle utensils by their handles. • Use metal or plastic scoops – not glasses, bowls, cups or plates – to scoop ice. • Discard potentially hazardous foods that have been removed from temperature control for more than four hours. Single-service items are used in many foodservice settings. They are manufactured to be safe and sanitary and should be handled carefully in foodservice establishments to maintain their cleanliness. • Handle containers as little as possible. In waited surface, servers should keep fingers away from any food-contact surfaces of cups, plates or other containers. In self-service situations, stack disposable plates, bowls and cups bottom side up, so customers do not touch the eating surface of another customer’s plate. • Handle unwrapped forks, knives and spoons by the handles. Load utensil dispensers with the handles pointing out. • Do not touch the drinking surface of cups when removing them from their plastic sleeves. Avoid overloading cup dispensers. • Never re-use single-service articles even if they appear clean. • Label and date food before cold storage. • Cool foods from 135 F to 70 F within 2 hours and from 70 F to 41 F within 4 hours. Do not cool food at room temperature before putting in the cooler. • Do not mix fresh food with leftover food. • Divide food into smaller batches and put in shallow 4-inch deep metal pans. Liquid foods should be no more than three inches deep, and thicker foods should be no more than two inches deep. Set the open pans on the top shelf of the cooler and cover the food after it has cooled. • Use an ice bath to speed cooling. Place container of food in a larger container filled with ice water to reduce cooling time. Stir frequently during chilling to promote cooling and measure temperature periodically. • Reheat previously prepared foods to at least 165 F for 15 seconds within two hours. Microwave-cooked foods should be rotated or stirred midway through the heating process and should be allowed to stand two minutes to allow for dispersal of heat. • Do not reheat foods in hot holding equipment such as steam tables. • Keep clean by bathing daily, using deodorant, and washing hair regularly. • Keep hair under control by wearing a hair restraint. • Wear clean clothing/uniform and/or apron. • Avoid wearing jewelry, which can harbor bacteria and cause a physical hazard if parts fall into the food. Jewelry also can pose a personal safety hazard if it gets caught in the equipment. • Keep fingernails clean, unpolished and trimmed short. • Wear a bandage and plastic gloves if you have open cuts or sores. In some cases, employees should perform other non-food-related tasks until the wound heals. • Do not chew gum while on duty. • Do not smoke cigarettes while performing any aspect of food preparation. • Avoid unguarded coughing or sneezing. Wash hands after coughing or sneezing. • during food preparation as often as necessary to prevent cross contamination when changing tasks and when changing from handling raw foods to cooked foods. - coughing, sneezing, using a handkerchief or tissue. - touching bare human body parts. - eating, drinking or smoking. - handling raw meats, poultry and fish. - handling garbage, sweeping or picking up items from the floor. - using cleaners and other chemicals. - handling soiled equipment and utensils. - switching between raw foods and ready-to-eat foods. 1. Use water as hot as can be comfortably tolerated. 2. Moisten hands and add soap. Lather to the elbow if possible. 4. Wash all surfaces, including backs of hands, wrists, between fingers and under fingernails. 5. Rub hands together for at least 20 seconds. 6. Rinse thoroughly under running water. 7. Dry hands thoroughly with a paper towel or hot air dryer. 8. Don’t touch anything that will recontaminate your hands. Use a paper towel to turn off the water faucet and open the restroom door if necessary. Surfaces and equipment may look sparkling clean, yet bacteria may be present in large numbers. Cleaning is the physical removal of food and/or soil from surfaces. Clean does not necessarily mean sanitary. All food contact surfaces must be sanitized. Sanitizing takes cleaning a step further by reducing the number of bacteria present. Sanitizing does not make a surface sterile or germ-free. Sterility would be impractical and too expensive for foodservice operations. Sanitizing agents differ in the amount of contact time required and their concentration and temperature requirements. When using combination products, such as detergent-sanitizers, cleaning and sanitizing must done in two separate steps. First use the detergent-sanitizer to clean, then prepare another solution of the same agent to sanitize. Cleaning cloths can contaminate surfaces. They should be stored in sanitizing solution when not in use. Sanitizing may be accomplished manually or with equipment such as dishmachines using heat (as steam or hot water) or chemicals. When heat sanitizing, using a higher temperature generally shortens the time required to kill bacteria. Since equipment varies, procedures should be written that specify cleaning and sanitizing chemicals and methods for all areas of foodservice. A schedule should be in place for cleaning, with records kept of when it was done. 1. Scrape or remove large particles of food. 2. Wash with an appropriate detergent/ water solution at 110 F.
3. Rinse in clean hot water. 4. Sanitize in hot water (171 F for at least 30 seconds) or use an appropriate chemical sanitizing solution such as chlorine(25 ppm: 120 F; 50 ppm: 100 F; 100 ppm: 55 F); iodine (12.5 to 25 ppm at minimum temperature of 75 F ) or quaternary ammonium (100 to 200 ppm at a minimum temperature of 75 F) according to manufacturer’s directions. Also refer to the requirements of your local regulatory agency. Centers for Disease Control and Prevention. (2015). Foodborne diseases active surveillance network (FoodNet). Hoffmann, S., Batz, M. and Morris, J.G. Jr. (2012). Annual cost of illness and quality adjusted life year losses in the United States due to 14 foodborne pathogens, Journal of Food Protection, 75(7), 1291-1302. Scharff, R. (2012). Economic burden from health losses due to foodborne illness in the United States, Journal of Food Protection, 75(1), 123-31. Scharff, R. (2010). Health-related costs from foodborne illness in the United States. Produce Safety Project, Georgetown University. U.S. Food and Drug Administration. (2013). Food Code 2013. 1. All employees must follow strict personal hygiene policies. 2. Potentially hazardous foods should be identified on the menu, and safe handling procedures should be established for each. 4. Time/temperature abuse must be avoided when handling prepared foods. 5. Potentially hazardous raw foods must be kept separate from ready-to-eat foods. 6. Cross-contamination must be avoided: Establish handwashing guidelines. Wash, rinse and sanitize all food contact surfaces. 7. Foods must be cooked to recommended internal temperatures. 8. Hot foods should be held hot (135 F or greater) and cold foods held cold (41 F or lower). 9. Foods must be cooled from 135 F to 70 F in two hours or less and from 70 F to 41 F in four hours or less. 10. Leftovers must be heated to 165 F for at least 15 seconds within two hours. Leftovers only should be reheated once. References: U.S. Food and Drug Administration Food Code, 2013.